Post-doctoral fellow David Palma from Portugal says that the way NTNU welcomes researchers from abroad is outstanding and that this made it much easier to adapt to Norwegian culture. 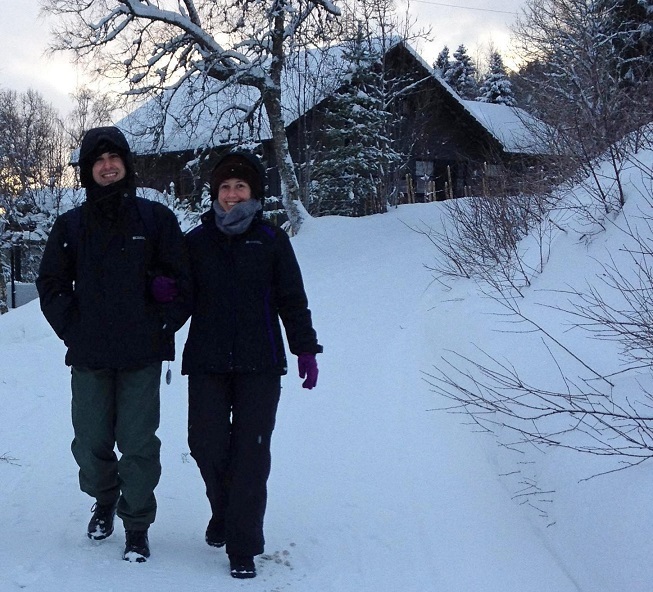 David Palma and his girlfriend Stella Martins appreciate the clear distinction between work and private life in Norway and enjoy the opportunities for outdoor recreation. Photo: Mona Nordaune. David Palma (30) works in the Department of Telematics with a grant under the Marie Skłodowska-Curie actions (MSCA) scheme. The position at the Norwegian University of Science and Technology (NTNU) provided the Portuguese researcher with a golden opportunity to learn more about Nordic culture. I have worked with a lot of people from different countries and have been involved in several EU projects, but the Nordic cultures were something I was interested in and eager to know a little bit more about, Dr Palma states. His opportunity came in the form of an MSCA grant. Dr Palma had contacts at NTNU and the university invited him to Trondheim to prepare an MSCA grant application. The people at NTNU were very kind. NTNU has a programme that I think is awesome – bringing people to the institution to get to know it and who they will work with. I think that it is very important to establish this connection, he says. The funding was allocated and in 2015 David Palma arrived to settle in a new country. It was a great help to have the assistance of NTNUs International Researcher Support services. The group helped with accommodations and all the legal and practical issues. That was very helpful. My supervisor even met me at the bus stop and took me to pick up the room key and everything. NTNU has a whole setup that is very, very friendly and reassuring for international researchers. No other universities in my experience offer all these services , he states. At the same time, he points out that it takes time to deal with all the necessary formalities, as NTNU makes clear beforehand. Altogether, it took him a couple of months. Getting an appointment with the police to get all paperwork in order, for instance, requires somewhat of a wait. His girlfriend moved with him to Norway, but has had trouble finding a permanent job. She has turned to part-time work as an English instructor. Both of them are learning the language. NTNU offers Norwegian courses for researchers. It is a little bit hard for a professional who has a research career. If the language is not used, it will be secondary. But I have taken Norwegian classes now, and it is easier to read and follow conversations , David Palma explains. It is not as easy speaking Norwegian in the streets just yet, however, especially when this involves the local Trøndersk dialect. But Dr Palma has not found his lack of Norwegian skills to be a barrier. People are very helpful and friendly, and English is often enough. But the Norwegian language is necessary for going to the next level of being part of the Norwegian culture, he points out. One aspect of Norwegian society that differs widely from Portugal is the clear distinction between work and free time and family life. This is very good and positive. In good weather you can take advantage of it and go outdoors, and when it is raining you work a bit more. That is very different, he states. Since he is part of a new culture and a new country, David Palma is trying to get involved in many of the social and other activities available, and not just focus on work. For instance, NTNU regularly arranges an international coffee and conversation meet-up where it is possible to meet other international researchers. And the Department of Telematics gets together for a beer on Fridays and organises activities like bowling and mushroom picking. These activities are good ways to explore the country, to get to know people and to get to know the culture. All this is part of the experience of moving to another country , he says. I think the level is very high in my field and institution. And there are more opportunities, funding-wise for instance. The bodies that exist to support European proposal initiatives are outstanding compared to other institutions I have been connected with, Dr Palma adds. There is a group in the department that provides support for those seeking EU funding. David Palma had not experienced this at any other university. When he worked in Portugal he participated in several EU projects. It is easy for researchers to find opportunities in Norway. If you are good in your field the doors will be open. Don’t focus purely on work. Take part in social activities. Go out and enjoy yourself. It will have a positive impact on your work. Schedule an appointment with the police beforehand, as the waiting list is long. You have to get a residence permit to be issued a Norwegian national identity number, which you need to have before you can open a bank account and get an NTNU ID. Consult the NTNU website. It provides numerous tips and advice for foreign researchers and students.